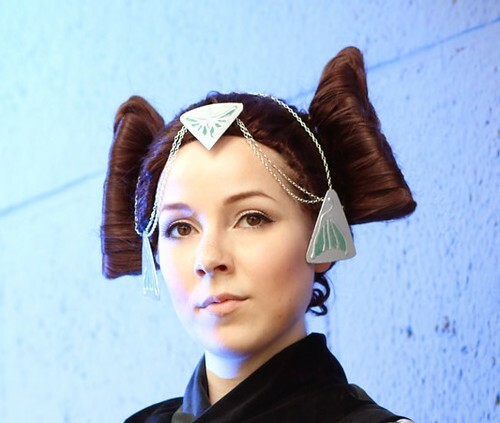 I'm new to the forum and this is my first project: i did a Packing Gown a few years back and i'd like to slowly revamp it to rebel legion standards with hope of submitting it some day. I'm in no rush though, i'll just add to it piece by piece. The fabric i chose is obviously too thin/shiny and just doesn't look good. There's also not enough volume in the skirt. I plan on getting new fabric for this, maybe something like silk dupioni or shantung. Suggestions for skirt fabric would be highly apprecited as i haven't been able to find one i like so far! I already have a petticoat that i plan on wearing under the skirt. The sleeves are made out of a nice flowy silk fabric that i really like and i really like them. 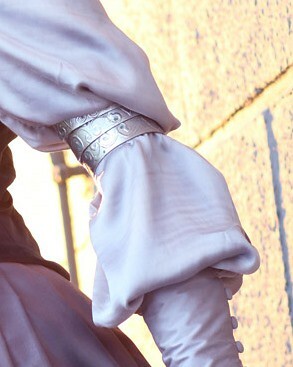 However they miss the dark gray piping at the cuffs and i think i could make them a bit more puffy. I also think my cuffs might be slightly too long and i would make them a bit shorter. The sleeves are not my first priority though as i think the overall look of them is ok. I think the pattern i made for this is good, however i didn't put any structure in the vest. That's why it doesn't fit me quite as it should, it pulls at some points and just doesn't sit very smooth. 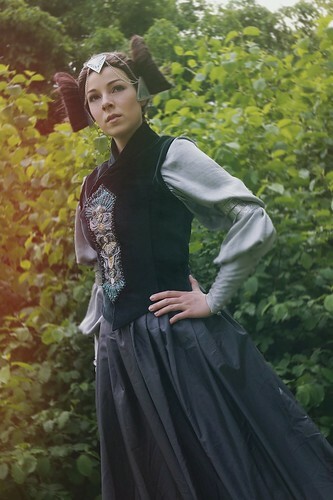 I would like to remake the vest with the same pattern but putting boning in it as a structure. I'd also like to make it slightly longer in the waist. I have my eyes on some dark gray silk velvet that i think would be nice to remake this. This part i really liked and i think i can keep it. I might just take it off the old vest and stitch it on the new one. Those were made last minute out of worbla and i really need to remake them. They didn't fit me and i could't put them high enough on my arm. I already got some aluminium sheets and plan to follow some tutorials i have found. god, i hated doing these, i'm not good with wigs I think this came out ok and woulnd't need to be redone, i'd like to add a lacefront to the wigh though. It does have the high bun on the back btw. The jewelry is made out of worbla like the bracelets and i'd like to remake them aswell. That's all i can think of right now. If someone knows this gown better than i do and has some tips for me or has noticed something i have wrong please tell me! 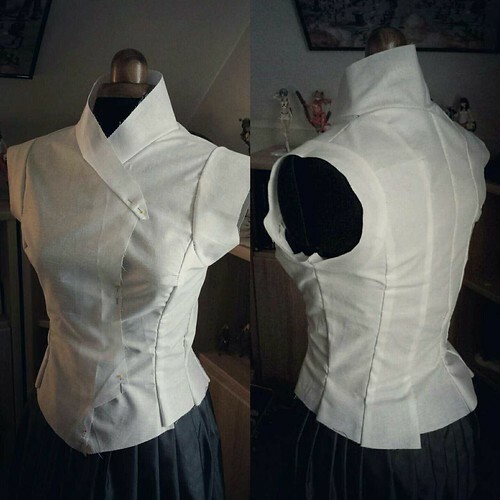 - your corset indeed needs structure, a "stomack corset" as you seems to wear under isn't enough, you can add some "frame" and your collar needs frame and to be higher. 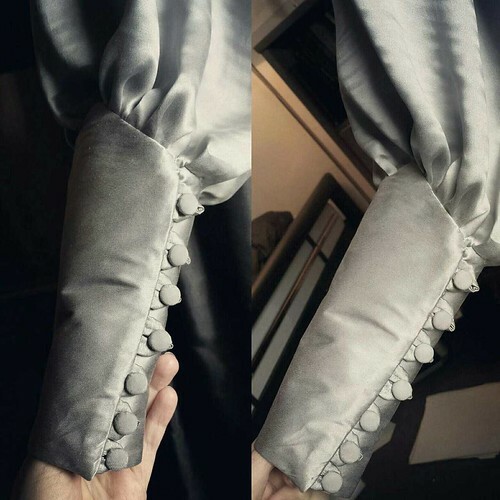 - the grey shirt seems fine but take care that your bracelets don't fall (great if you can remade them so they could seem more rounded on the edges) and so we can see the 4 of them, I think your sleeves are enough "buffy" just need to adjust correctly. - your skirt fabric is good (for my opinion) and indeed you can add some petticoat or layers of fabrics to expand a bit more your skirt. 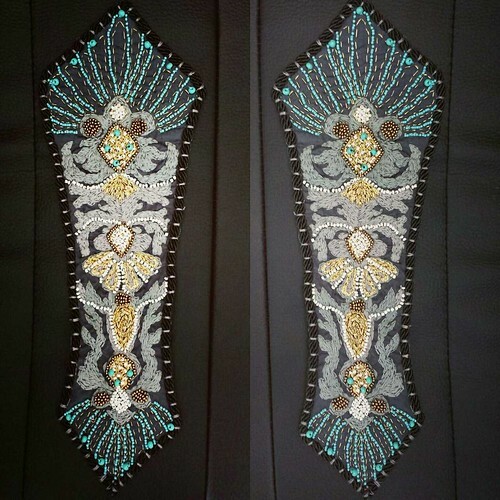 Ask the design onwer if she can make some for you. In general, your costume has a good looking, no doubt you'll make it perfect. Thanks for your answer Yumi! The vest is really the thing that sticks out most as it just doesn't fit me like it should. 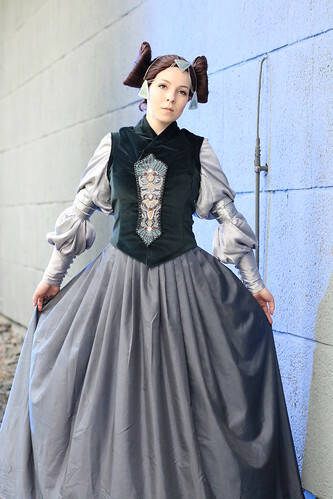 I plan on making a "base" for this from sturdy cotton and bone that like a corset and put the fashion-fabric aka the velvet on top, then wearing that over my new victorian corset. It really should shape me the right way then and lay flat as it should. I've also thought about putting some fleece or thin felt in the collar so it stand up, i've done that before and it worked great so we'll see. I think if the sleeves look fine i'll really work on them last, i too think the biggest problem with them is how the bracelets sit on them. those will probably be the first thing i remake as i have materials for them here. The skirt fabric looks ok in the pictures but in person you can see it's flaws, it's really thin and shiny polyester lining fabric and just looks cheap. I have found some nice silk dupioni fabrics that i think would work great - i'll order some swatches! I think i like without slub more but i'll try both. The wig could really need some work... the problem with it is that it's really uncomfortble, it presses down on the ears so much so they really start to hurt after some time. I've thought i might add a lacefront (so much work tho eeh) which would make it look more natural and i would be able to pull that closer to my ears. I kinda want to try to attach the "buns" directly to my real hair which i could do now as i have dark brown hair again but they're pretty heavy and my hair is so thin... i don't think i could make them stay in place tbh. I might have to redo them in lighter fake hair. But it WOULD look nicer... hmm. It seems you have planned a great update, keep us on touch throught each stapes if you can. And yes you were right on things which needs a bit of work to make your costume amazing. Good idea for the collar. For the wigs it's quite difficult to find a confortable structure, hope you will find a way. Don't hesitate if any question spots out during the process. I love this costume so much- watching this for sure! 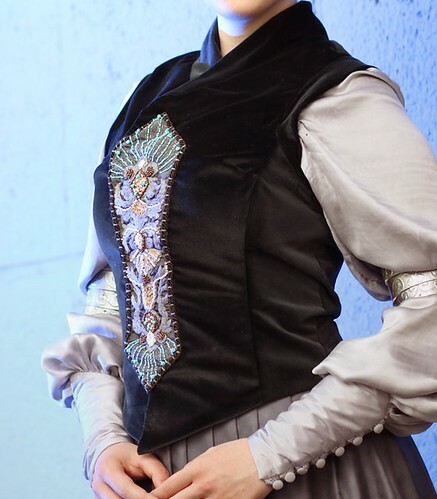 You have a beautiful costume and I can fully understand wanting to upgrade it. And I agree that your embroidered piece looks very nice. Have you looked at thai silk as a possibility for the skirt? It has some structure and texture and a medium-dark grey thai silk would look great, imo. 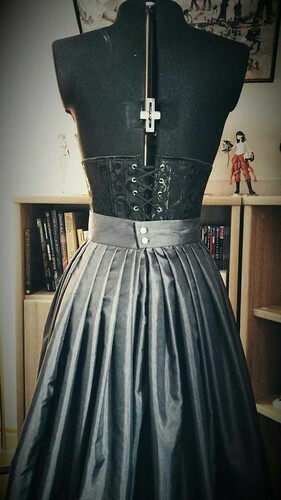 I own this dress aswell, and just made new buns myself for the same reason of them being too heavy (and slightly too dark in color). I use my real hair, and attached the new buns to a hairband instead of pinning them into place and it makes a HUGE difference. I barely feel I'm wearing them and the hairband gets hidden by my hair so it looks just the same as pinning them on. Thanks! I think this might be the first costume i've ever upgraded, i'm usually not really motivated to touch a costume once i've "finished" it. This dress though was my favourite Star Wars costme for YEARS so i reallo wanna do it justice. 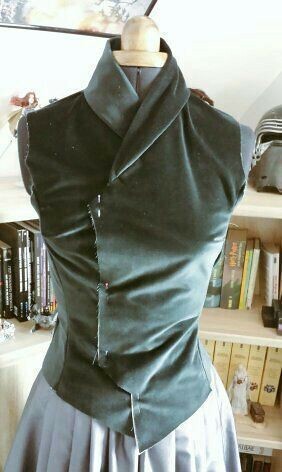 What i have ordered some days ago is a beautiful dark gray silk velvet for the vest so i can get started on that one soon. Thank you! I'm sure it won't be perfect but i'll do my best to get it as nice as i can! 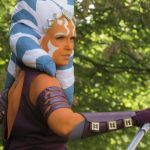 I've remade one costume three times and is currently remaking another one and it is pretty frustrating redoing costumes, but if you really love them you want to do them justice. And after all, we keep learning and getting better. 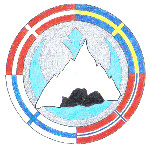 Following your progress as I am looking to make this one myself.